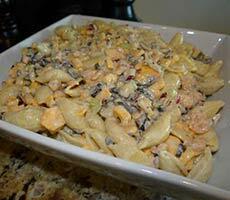 Take a look at some mouthwatering baby shower food ideas and recipes to serve at your party. 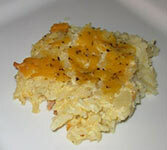 These side dishes can be used to compliment that perfect main dish or appetizer tray. Good luck your quest of finding the perfect baby shower recipes! 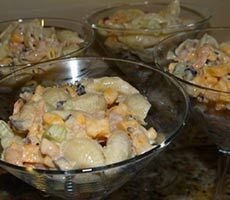 You can also view and share your favorite baby shower recipes with our website readers by clicking above. Thaw potatoes about 30 minutes. In a large bowl, mix potatoes and onions with combined soup mixture of soup, sour cream, melted margarine and grated cheese. Add salt and pepper. Place in 9 X 13 baking dish. Bake at 350 degrees for 1 hour. Mix all ingredients together. Chill and serve. Clean and slice strawberries. Set aside. Cook almonds on low heat with sugar and a few drops of water until coated. Set aside. 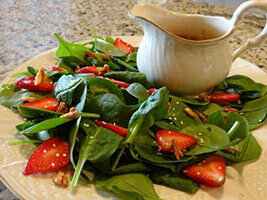 In a bowl, mix sesame seeds, poppy seeds, oil, sugar, balsamic vinegar, and paprika. Toss spinach with dressing before serving. Add strawberries and mix well. Cook pasta as directed, drain. Combine all ingredients. Chill before serving. Preheat oven to 450 degrees. Combine Asparagus, bell pepper, onion, oil, garlic with salt and pepper to taste. Spread vegetables in a single layer on a baking sheet. Bake until vegetables are tender and golden brown (around 25-30 mins). Allow to cool completely. Meanwhile prepare Orzo pasta according to package instructions. Drain Orzo and rinse with cold water. Place in large serving bowl. Mix with vegetables and remaining ingredients. Refrigerate until ready to serve. Cook Tortellini according to package directions. Drain and rinse under cold running water. Transfer to serving bowl. Add remaining ingredients. Toss. 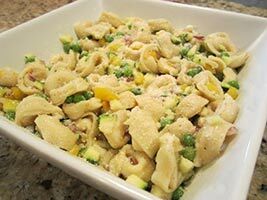 Tortellini salad can be made with other mix ins. 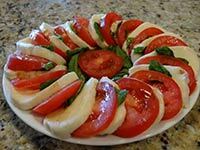 Just use the things you like, for example: cherry tomatoes, olives, artichoke hearts, and cubed cheese are great add-ins to use. Arrange tomato and cheese slices on a platter, alternating in rows. Drizzle with oil and vinegar. Garnish with Basil. Season with salt and pepper. Serve with Baguette bread slices. Juice and zest limes. Combine lime juice and zest with orange juice and vanilla in a small bowl. Mix well and set aside. Cut melons into cubes and place in a large serving bowl. Add grapes. Pour dressing over fruit and toss lightly. Chill and serve. Preheat oven to 400 degrees. Combine chopped pretzels, margarine and sugar in a medium sized bowl and stir to fully coat. Press mixture into a 9x13 inch dish. Bake for 8 minutes. (Don't over bake) Cool completely. 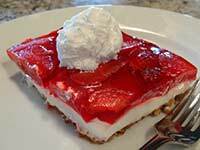 To make the cream cheese layer, combine cream cheese with sugar and blend until smooth. Fold into cool whip. Spread cream cheese mixture over cooled pretzel mixture. To make top layer, mix Jell-O and boiling water and stir until Jell-O is dissolved. Add berries. Cool in refrigerator for 30 minutes until slightly thickened. Pour cooled Jell-O on top of cheese mixture and refrigerate for 4 hours or more. Enjoy! A beautiful and easy way to serve salad to your guests. Layer your salad fixings evenly in a glass serving dish. 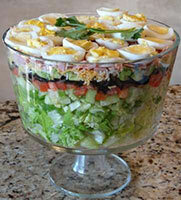 Pictured in the dish above starting at the bottom is lettuce, green bell pepper, celery, cucumbers, tomatoes, olives, avocado, shredded cheese, chopped ham and sliced boiled eggs. You can add any other types of salad ingredients you would like. For instance shredded carrots, sliced almonds, crumbled bacon, shrimp, grilled chicken, spinach, feta or blue cheese, etc.